A collection of bird pix that do not fit in any of our other categories. Please keep in mind that as Reusable Art grows we will be continuously adding new categories and bird images you have found here in the past may have been moved to a more specific category. 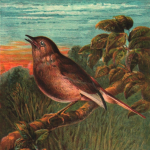 All of these bird images are copyright free and in the public domain in most countries and are downloadable for free. So many wonderful bird illustrations from Harrison Weir and this one is no exception. A bird on a branch serenading the setting sun with an evening song. 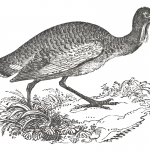 160+ year-old bustard drawing and engraving. 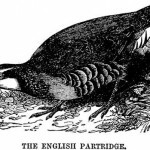 They are large, terrestrial birds with long legs and brown feathers. Drawing should print 8×10 inches. 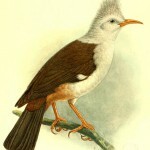 Vintage white bird drawing of a bird that may have existed hundreds of years ago. This pretty bird drawing is based upon descriptions and bones. 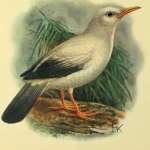 Beautiful drawing of the Hoopoe Starling. 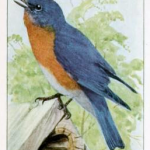 Fuertes illustration of a bluebird. 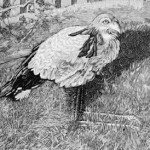 Vintage drawing of a secretary bird from Africa. 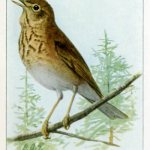 Agassiz drawing of a russet backed thrush. 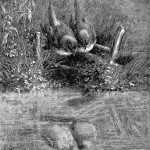 Two birds sit together on a small fence contemplating their reflection in the pond water. 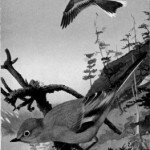 Free illustration of a pair of Townsend’s Solitaire birds. 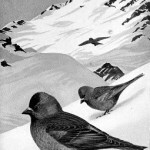 Pair of Brown-Capped Leucostictes birds in the snowy mountains. 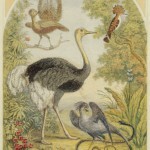 Drawing of a wide variety of birds from around the world.